This book is about the processes and techniques of designing, stitching and completing realistic interpretations of Landscapes. 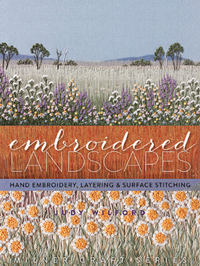 The processes described in this book will enable any embroiderer from any country in the world to adapt and produce hand-embroidered landscapes portraying their own regions. The techniques are the combination and adaption of different art genre, textiles, traditional stitchs and hand embroidery techniques. It is the result of over 25 years of experiment, refinement and tutoring by author, Judy Wilford.